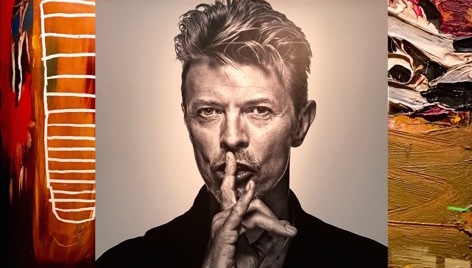 Sotheby’s glamorous upcoming sale in London of David Bowie’s art collection – endowed with the finest of museum-lit displays in anticipation of large crowds – has given the public the chance to connect with the man each and every one of us feels they lost in January. Walking around it is to experience Bowie intimately, within breathing distance of rooms he inhabited. His presence is palpable and the art says more about him than about the artists responsible for the pieces. His choices seem un-curated, inspired by bric-a-brac collecting, characterised less by searching and more by happy stumbling, a happenstance of an affair with something he fell in love with, or that resonated. His eye was excellent, if untrained, and therefore refreshing, and feels tentative at times, like a student buying his or her first chair. The artwork grows in stature and impact, as if graduating to a first home he remains faithful to the bedsit of his youth, whacky and oblivious to the future success that would allow him to fully indulge his passion for art and famous artists. 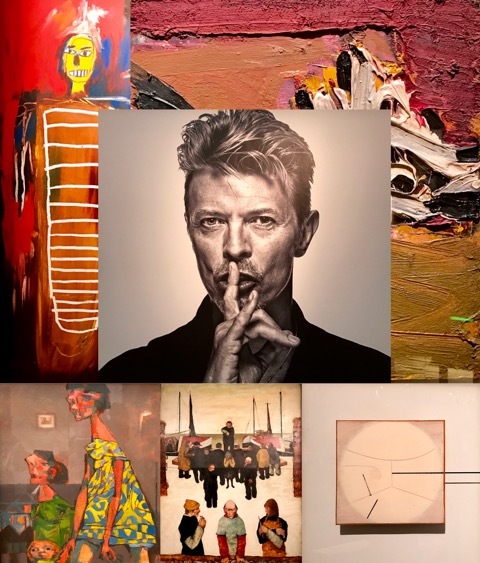 The contrast between large and small paintings, some of significant artistic consequence and others of little, speaks of Bowie’s interest in the creative process itself, and its experimentation, which provided him with worldwide hits and adulation as well as with periods of quiet idling. And the sheer amount of work in the form of paintings, drawings, sculpture, furniture and objects, contained in seven large rooms, echoes less the personality of an ambitious accumulator but of a child’s, whose fondness for his or her toys prevents a parent from separating them out in terms of relevance. Some pieces are as modestly-sized as a bookmark, in pencil or oil, others take up an entire wall, and all appear to have been picked up with first-time excitement, one imagines, over a dinner at someone’s house, a stroll into an auction house on a crisp autumn day, thumbing through a catalogue or at a city’s art fair while on a recording stint abroad. People of all ages and incomes milled inside Sotheby’s welcoming atmosphere, looking, but forever seeking their attachment to the man himself, within his line of vision; elderly twin sisters in matching raincoats prodded “Don’t Touch” furniture items, they opened drawers and pulled on knobs like curious Star War creatures entering Major Tom’s vessel. The contrast speaks of Bowie’s interest in the creative process itself, and its experimentation… another reminder of his state of mind – questioning, creatively challenging, surprisingly unassuming and devoid of anger. The grey-haired English of literary festivals squinted at the attributions on the wall, eyeing a little drawing as one does at the Royal Academy’s Summer Exhibition, hoping it’s affordable, of a Cornish Harbour, a still life, a small abstract; their comments about the light of a painting or the lie of a landscape confirming their first-hand knowledge of 20th century interwar artists such as David Bomberg and Wyndham Lewis, and later stalwarts of the British zeitgeist, Reg Butler and Leon Kossoff. Americans and the business attired, those glowing with rarefied living on the streets of Mayfair, also inhaled Bowie’s persona while they discreetly assessed the higher ticket items; two Damien Hirst “wheelies” of vibrant colours, a gem or two of Auerbach, or a classic Jean-Michel Basquiat. And Japanese hipsters imbibed the general thrill. We all felt privileged to be there. Visitors bought catalogues and pointed smart phones in an effort to retain a part of him. His music, which played faintly in the background – “blue, blue, electric blue… sound and vision” – and oversized photos of him lent melancholia to the exhibit, filling the room with his spirit as paintings channelled his presence and everyone longed to have him back. 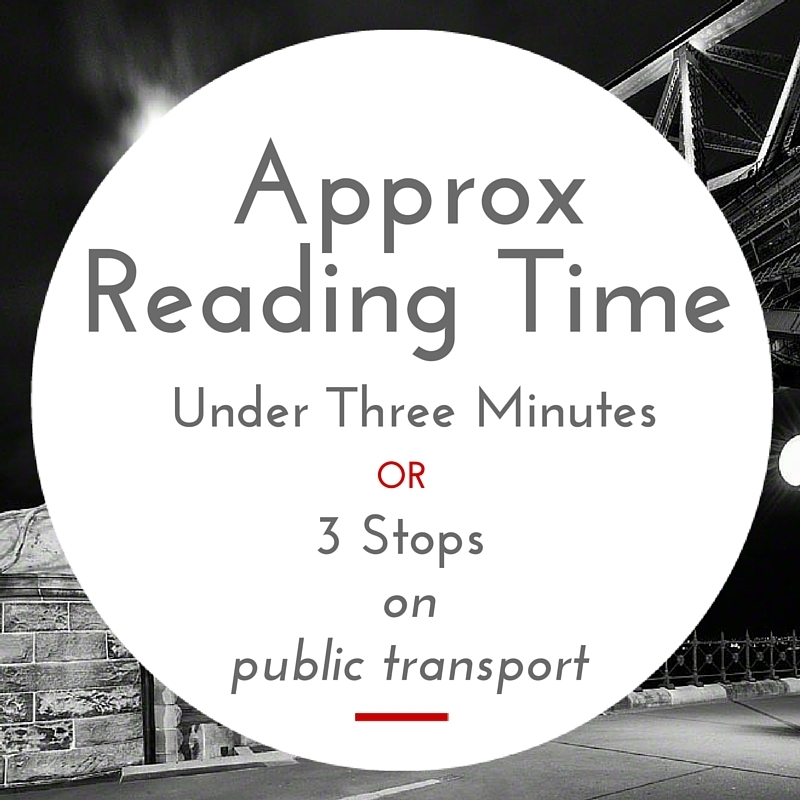 The effect of examining artwork attached to a price tag changes the nature of an art exhibition, as one gauges artistic output and financial input in equal measure, with surprising conclusions of what the market dictates. It reveals the existence of a parallel world of activity that a casual museum visitor knows nothing about but, more importantly, the character of the revered man himself, driven not by commercialism but by the humble and grand alike. The collection, however, feels incomplete; one can’t help yearning for a sprinkling of past and more recent greats: de Kooning or a beautiful litho or two by Anish Kapoor, and considering his generous tribute to German art, Gerhard Richter, Anselm Kiefer, and given his wicked sense of humour, Sigmar Polke. After all, this must be only part of a collection whose remaining tranches have yet to be auctioned or will live on in private hands. No doubt prices will soar at auction, well above their estimates, and will bestow on lesser-known artists the added Bowie factor that might even revive or launch an artistic career or two. And why not. Nature and lifestyle choices might have determined Bowie’s state of health but the collection is another reminder of his state of mind – questioning, creatively challenging, surprisingly unassuming and devoid of anger. He was simply a lovely genius.